There will be a free Whopper offer 17th April via the Burger app or order on Deliveroo. 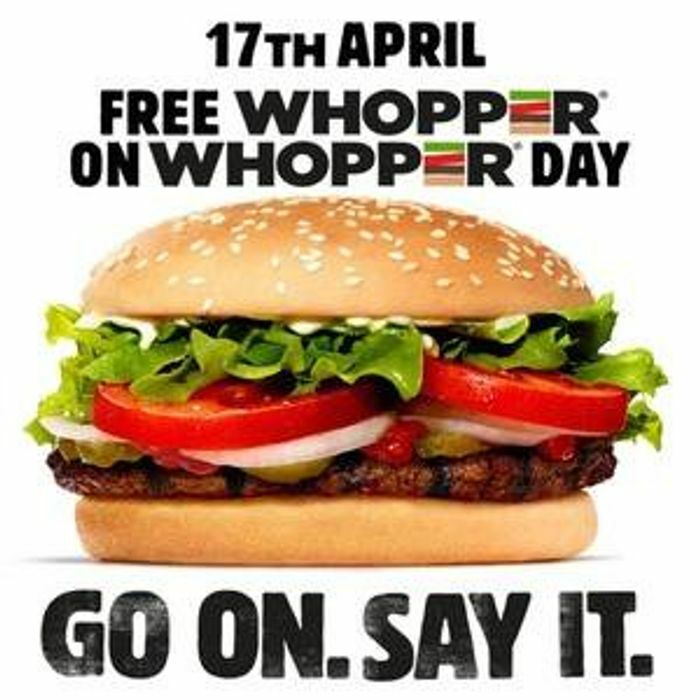 The promo is part of Whopper day Looking at the terms it will be from 17th April (6am) to 18th April (4am). If you check the app on the 17th April in the voucher tab there will be a code for the free whopper. If ordering through Deliveroo, one free Whopper will be added to your basket when you make an order. More info and terms below. Not valid in conjunction with any other offer. One voucher per in restaurant transaction. One free single Whopper per registered app user in-restaurant when you eat in or takeaway. No added cheese or bacon. Offer valid from 6am 17/04/19 subject to restaurant opening hours until 4am 18/04/19 subject to restaurant closing hours. Vouchers may not be transferred or made available by you to others. If ordering through Deliveroo, one free Whopper will be added to your basket when you make an order limited to one free Whopper per Deliveroo account. Valid only in the UK. Not exchangeable for cash. Valid at participating restaurants only while stocks last. Voucher valid at managers discretion. Manager's decision is final. Not valid at Burger King motorway service locations, airports, train stations and holiday parks. Yes so was mine! I've never ordered anything from deliveroo before and £35 went out of my account! SoniaRani had to have new bank cards for my husband and myself they made 5 orders over 2 days at over £140, even ordered a £40 bottle of jack Daniels cheeky buggers. thank you for sharing this. It is a great offer. I will check this out tomorrow. Thank you for who ever shared this deal I shall be sharing this with all my friends to let them know . Thanks for this - it worked! I wish I knew this earlier, would of had this for lunch. Gutted.